Standard Penetrometer Description: SE-Test India’s are leading manufacturers of Standard Penetrometer (Model No. 1302) that helps to establish the consistency of the specimen bituminous mix under pre-specified setting or other factors such as time, temperature, and load. It conforms to the ASTM D5, BS 2000 industry standards. The penetration results are expressed in the distance of 10th of millimeters that is vertically penetrated by the standard needle. 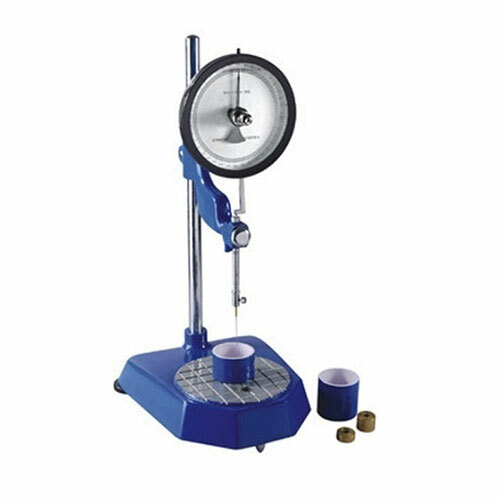 SE-Test India’s supplies the best standard penetrometer can be used in a rugged environment as it comes with base table clubbed with leveling screw. On the base, a vertical pillar is mounted with leveling screws. The head along with dial plunger rod a cone (or needle) slides on the pillar and can be easily clamped to any desired height. For fine adjustment of needle or cone tip to sample, it comes with a rack and pinion and pointer assembles. A clutch mechanism is included with which reading of the penetration level can be read easily and subsequently helps in resetting a simple and accurate operation. Comes with two sample containers, a bitumen penetration needle, and two ring weight of 50 gms. and 100 gms each, lead screw gear arrangement, Spirit level, and a digital preset timer. Accessories: Penetration cone for empirical estimation of penetration of , petroleum jelly, lubricating grease etc.